The ski season will soon be upon us! To get you ready, we’ll be posting preski workout tips and ideas every Wednesday for the month of October. This week: box jumps! The sport of skiing, especially on ever-changing terrain, definitely requires agility. If you can maintain a good rhythm in the turns on top if that, well you’ve got yourself a good skier. To get you there, you’ll need coordination, agility, endurance and power; physical attributes box jumps can help you develop. The exercise is pretty straightforward. First find a level surface, and then jump on it with joint feet. Joint as in very close, not tied together (just to be clear!). The height of the surface depends on your physical ability and can vary between 10 inches for beginners and 36 inches for athletes who desire a good challenge. A park bench is generally a pretty decent surface. Other options for this exercise include steps or short walls. The ideal method is to jump as many times as possible onto the platform in a given timeframe. A period of 30 seconds of jumps followed by the same length of time for rest is recommended. Repeat this 3 times. That gives us a 1:1 ratio of work/rest for a total time of 3 minutes … For such benefits, 3 minutes is easy to spare! The exercise can be adjusted via the height and speed of execution depending on your comfort level. It goes without saying that the objective is to make the most jumps as possible in 30 seconds. In your workout, try aiming for a much shorter down time and a more rhythmic and constant pace. 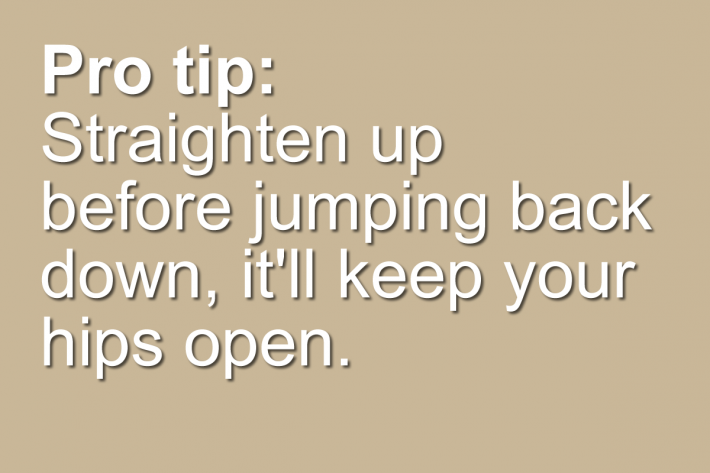 Preferably, there should be no break during the 30 seconds that are dedicated to jumps. Watch your shins! A missed jump can result in injury to the front of the shins… and it hurts. If you’re too tired or think the height is too much for you, find a lower surface. Give it your all, but be careful!